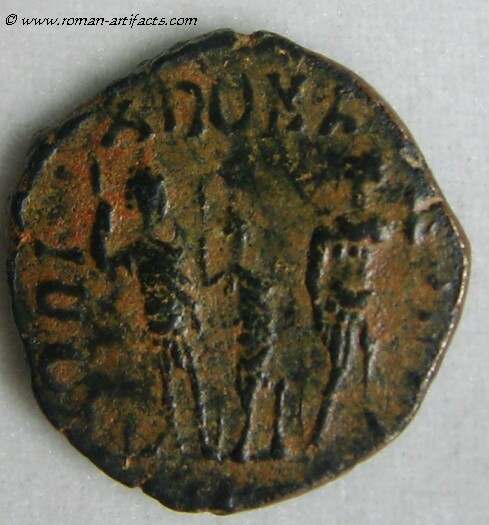 REV: GLORIA ROMANORVM, three emperors standing side by side holding spears, outermost ones rest hands on shields, the middle one holds an orb, [ANTA] in ex. RIC 153 (nice detailed bust and reverse, with nearly full obverse inscription, and partial one on the reverse). Due to the crude bust and smaller size, this coin is believed to be a un-official Vandal issue. OBVS: D N ARCADI-VS P F AVG, pearl diademed, draped, cuirassed bust right. 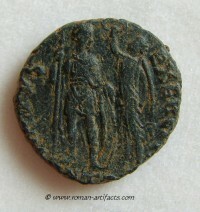 REV: VIRTVS-EXERCITI, emperor standing left, head right, holding spear and resting left hand on shield. Victory, standing beside him crowns him with a wreath held in her right hand. Amazing reverse detail, which is unusual for this late period coin. The die maker was extremely talented, something that faded in later years. 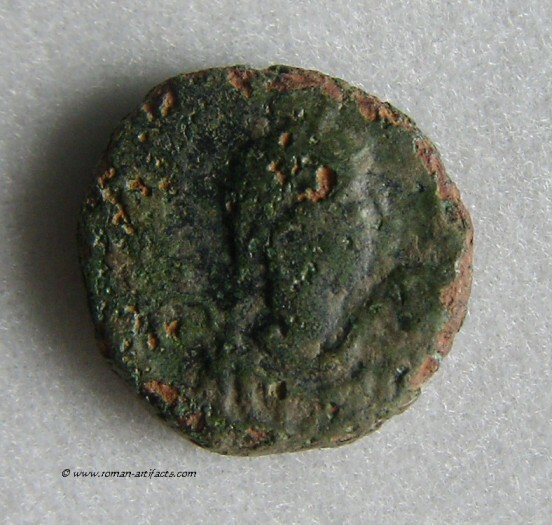 Flavius Aetius or simply Aetius, was a Roman general of the closing period of the Western Roman Empire. Scholars often have called him "the man universally celebrated as the terror of Barbarians" for this continued victories over the barbarian invasions of that period and especially against Attila the Hun at the Battle of Chalons (451 AD). 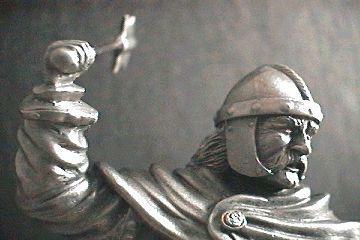 This battle although considered a stalemate was the first battle that put a stop to Attila's rampage through Europe. Attilla would never severely challenge the borders again and within 2 years was himself dead. 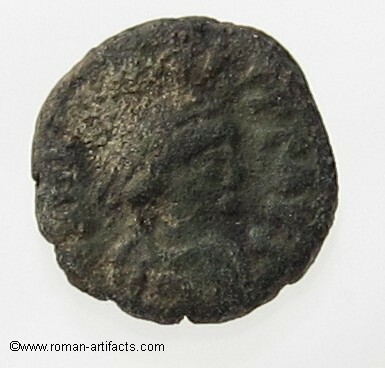 In 423 AD Aetius supported the new emperor Johannes who was praised for his mildness, intelligence, and general ability. 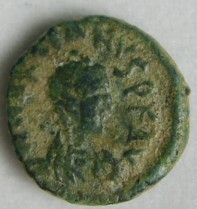 Unlike the Theodosian emperors, he tolerated all Christian sects. 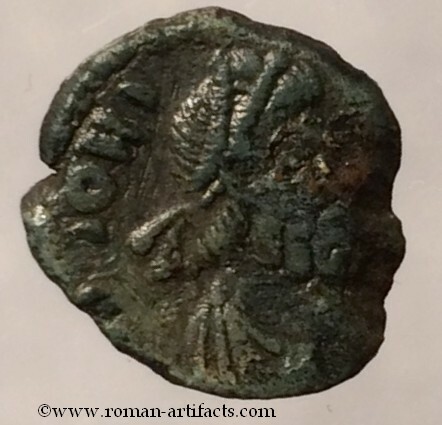 Aetius however arrived 3 days late (with a Hun army) to save Johannes who had been betrayed in Ravenna and killed by the army that Theodosius II (Eastern Emperor) had sent. 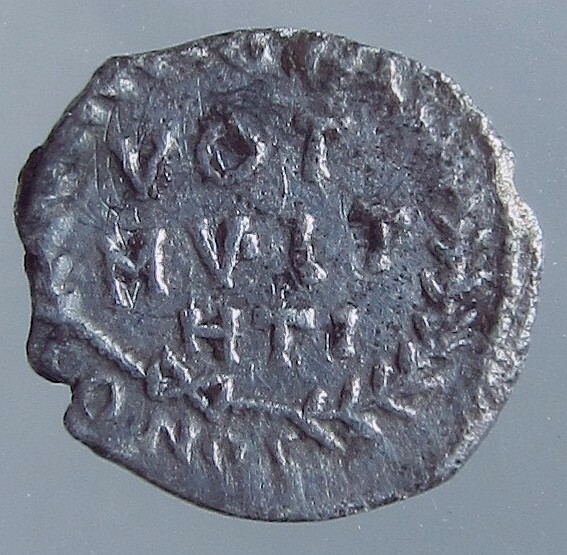 Valentinian III was then appointed emperor by Theodosius I. Valentinians 25+ year rule was considered incompetent and did nothing to save Rome from the barbarians. 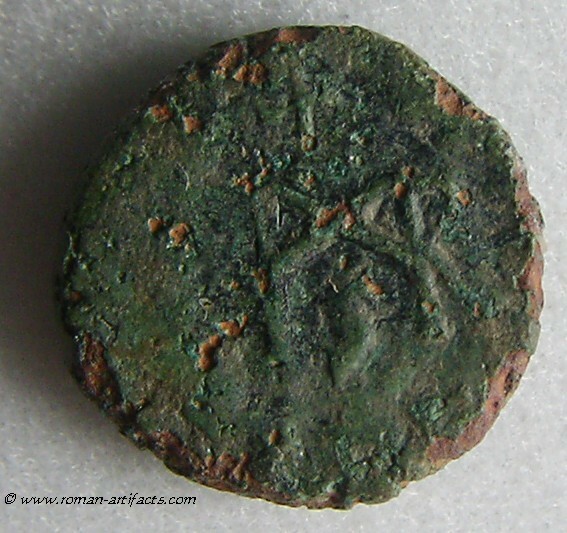 The final blow came in 454 AD when Valentinian III assassinated Aetius in Rome. "I am ignorant, sir, of your motives or provocations; I only know that you have acted like a man who has cut off his right hand with his left"
Rome would never recover and in within the next 25 years the barbarians would crush the last emperor, ending a thousand year empire in Europe. 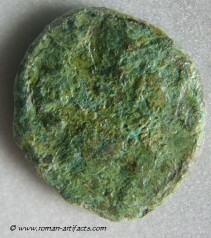 Carthage mint. 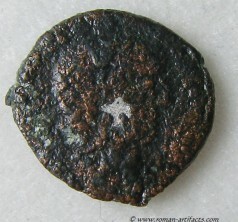 Struck AD 423-425. RIC X 3810 (very rare coin) This coin is attributed to Bonifacius. 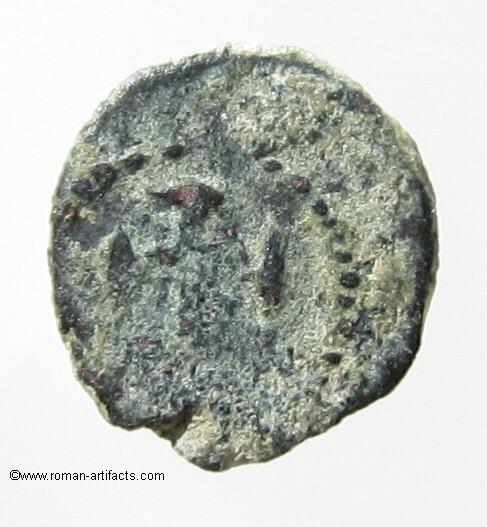 A key, but fleeting figure in the later Roman period. 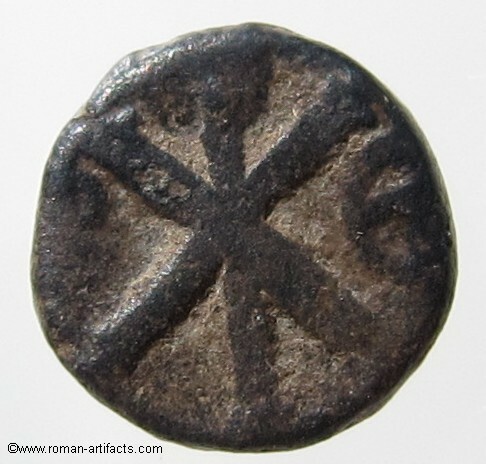 Comes Bonifacius (anglicized in Count Boniface) (died 432) was a Roman general and governor of the Diocese of Africa. 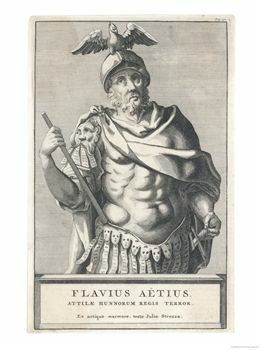 Along with his rival, Flavius Aëtius, he is sometimes termed "the last of the Romans." 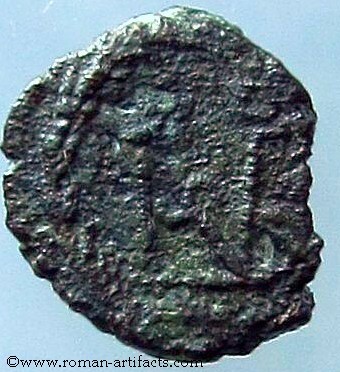 After the death of Emperor Honorius in 423, primicerius notariorum Joannes was elevated to the throne. 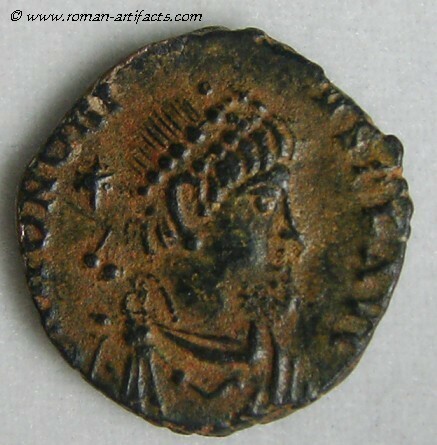 Bonifacius refused to acknowledge him, and prevented the plentiful shipments of African grain from reaching Italia. After a revolt in Gaul, and an uprising by general Aëtius, Joannes was overthrown, Valentinian III, nephew of Honorius, was made Western emperor by the Eastern Roman Emperor, Theodosius II. 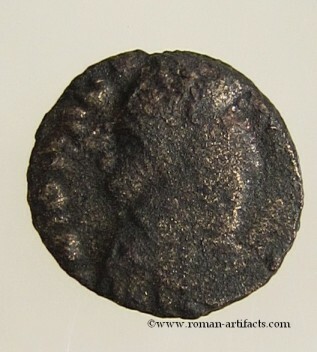 Bonifacius supported him, and resumed grain shipments. 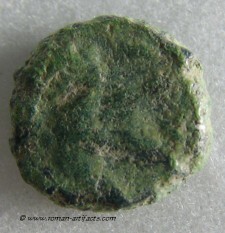 Under the influence of Aëtius, the emperor's mother Galla Placidia convicted Bonifacius of treason against the emperor. Rather than surrender to probable execution, however, Bonifacius called in the support of Vandal mercenaries from their grazing grounds in Hispania. The entire tribe migrated en masse into Africa. 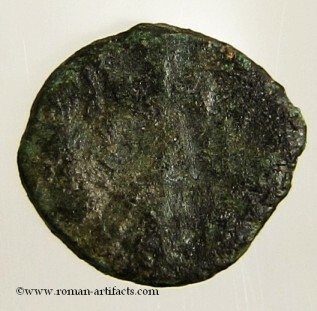 However, by the time they arrived, Bonifacius had returned to Placidia's favor, and she had granted him the title of Patricius. 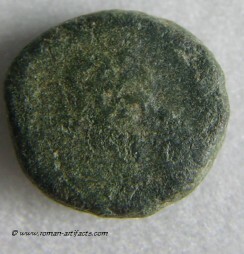 He informed the Vandals that their services were no longer needed, but instead of returning to Hispania, they revolted and drove the Roman Empire out of Africa. 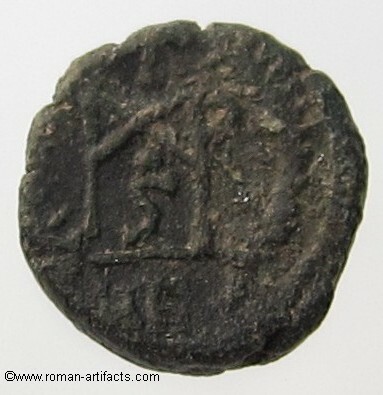 The Vandals would rule the diocese until the Eastern Romans under Flavius Belisarius recaptured it in 534. 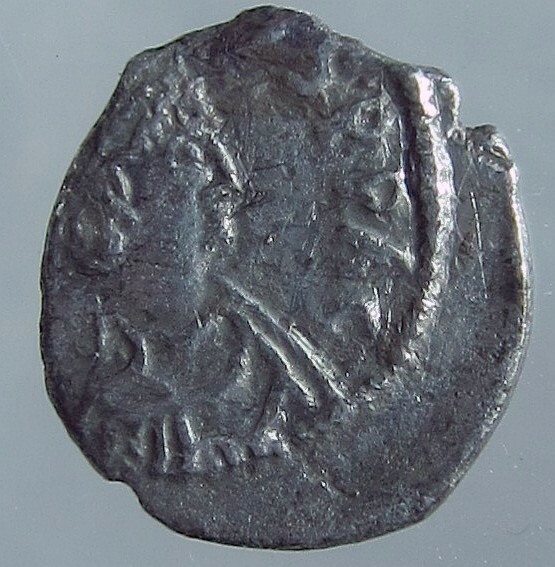 Bonifacius had been recalled to Italy before the Vandals had seized the province, elevated to the rank of magister militum praesentalis and to the dignity of Patricius. 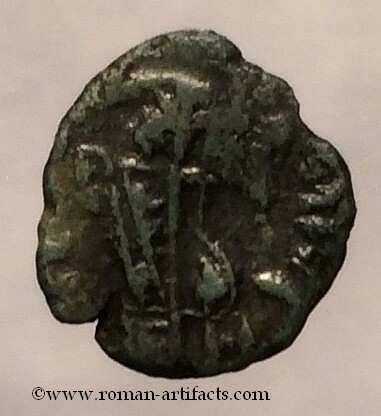 Fearing an imminent dismissal, Aëtius and his army of Germanic mercenaries marched against Bonifacius, descending upon Italy; the result was the Battle of Ravenna (432), which Bonifacius won, despite being mortally wounded. He died several months later, being succeeded by his son-in-law Sebastianus. However, the following year Aëtius would depose Sebastianus and become the de facto ruler of the Western Roman Empire. REV:[SALVS] REI-[PVBL]ICE, Victory advancing left, holding trophy over right shoulder, dragging captive with left hand; Christogram to left; P//RM (Rome Mint). 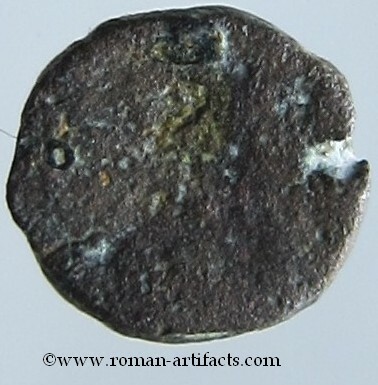 References: Nearly identical Obverse and reverse die of Johannes on a coin sold by Ancient Coins Canada. REV: No legend, Cross within wreath. 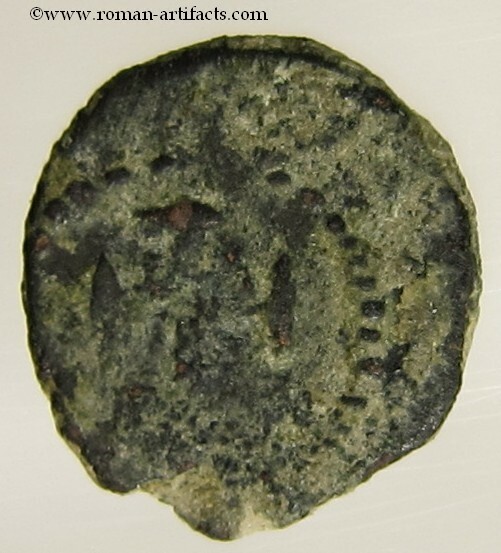 REV: Monogram of Marcian in wreath, + above, S below, CON in ex. Bronze AE 20mm. 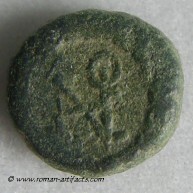 Constantinople mint, for use at Cherson. REV: SALVS R-PVBLICA (sic), Leo standing right, holding labarum & globe, spurning bound captive; CON. 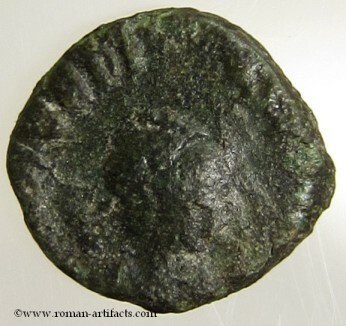 Rare coin for a short lived late Roman Emperor. 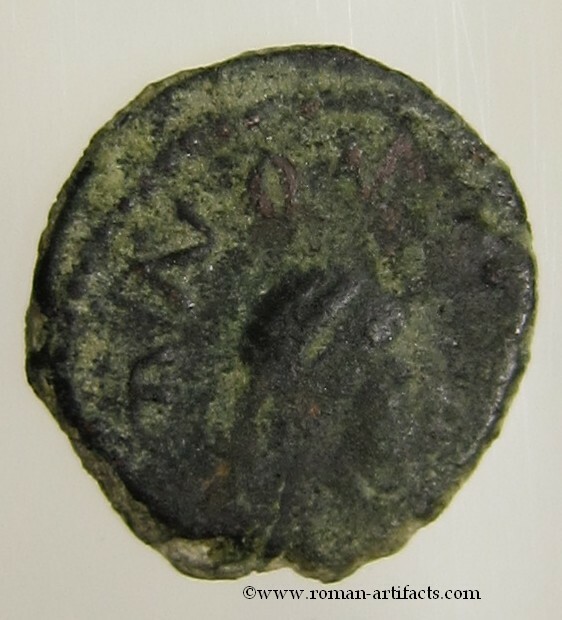 REV: Zenonis monogram within wreath. 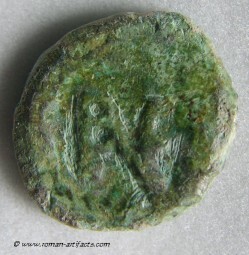 Aelia Zenonis was the wife of Basiliscus, who briefly usurped the throne from the Emperor Zeno in the critical year of 475/476 AD. 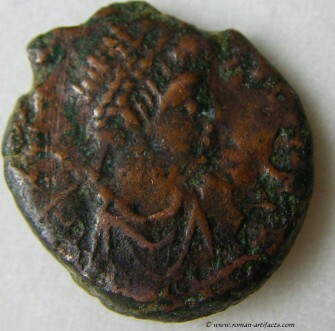 Very rare coin, even in this state. Nummus. 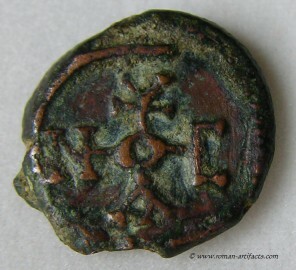 Constantinople mint, second reign. 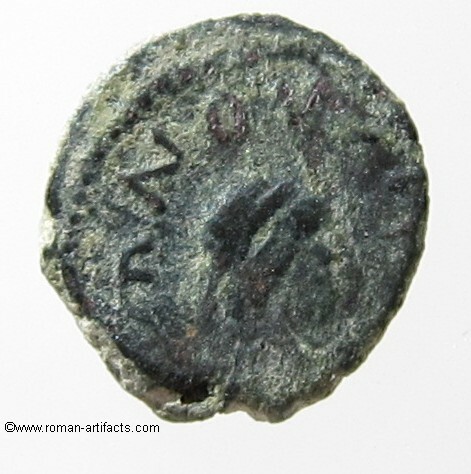 REV: Monogram of Anastasius within linear circle. References: SEAR 13 & DOC I 15. 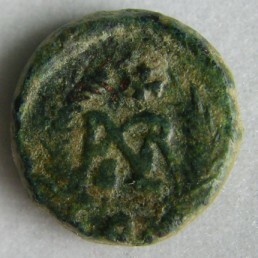 Struck circa 493-518 AD, Ravenna mint. REV: Monogram of Ravenna within wreath. 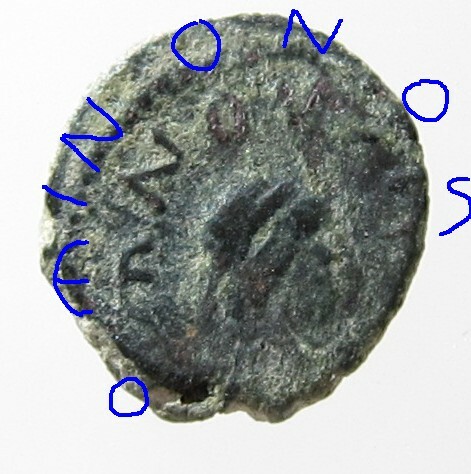 OBVS: DNIOHANNESPFAVG - Diademed, draped and cuirassed bust right. 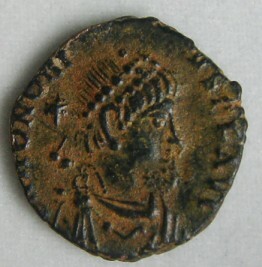 With distinctive beard of Johannes. 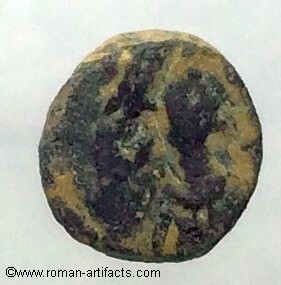 References: Believed to be a Vandal issue, due to the unusual reverse victory shape and the slightly different bust. The face however clearly is bearded and the features otherwise fit the above official mint. 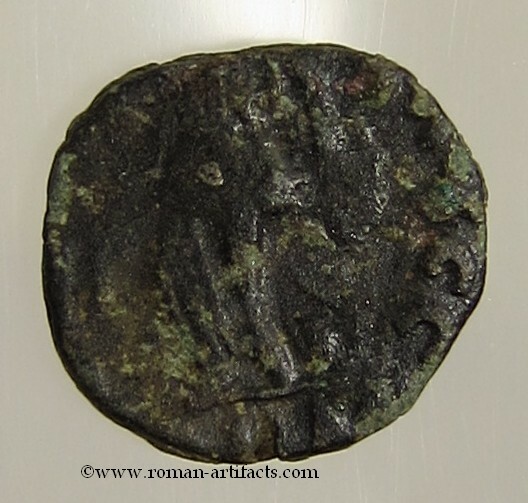 The Gothic War was a war fought in Italy and the adjoining regions from 535 AD until 554 AD between the army of the Eastern Roman Empire (Byzantine) and the tribes under the control of the Ostrogothic Kingdom of Italy (which began after Odovacar deposed the last Western Emperor in 476 AD). 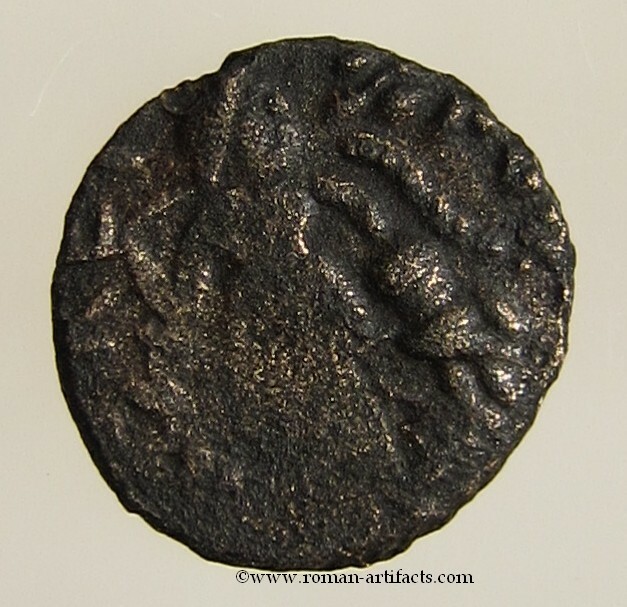 It is commonly divided in two phases, the first (535-540) which ended with the fall of Ravenna and the apparent conquest of Italy by the Romans, and the second phase (540/541-553), where the Gothic resistance was reinvigorated under Totila (Baduila) and was surpressed only after a long war by the General Narses, who also defeated the Frankish-Alamannic invasion of 554 AD. 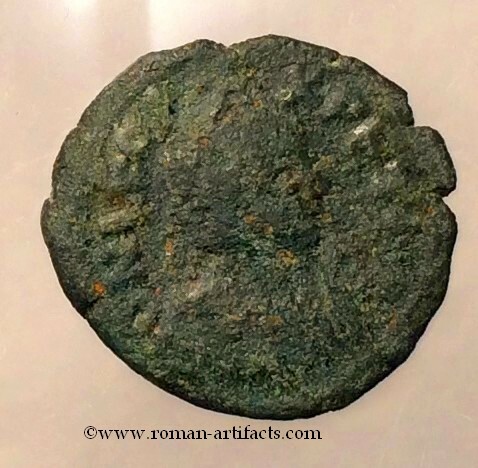 The war had its roots in the ambition of Roman Emperor Justinian to recover the provinces of the former Western Roman Empire, which had been lost to invading barbarian tribes during the previous century. The long duration of the conflict meant that in the end Italy was devastated and depopulated with the Italian population dropping from 7 millions to 2.5 millions as a consequence of war, famine and epidemics. 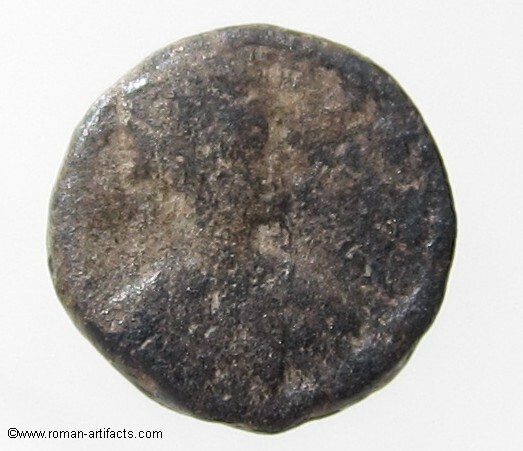 The Eastern Empire's resources were depleted and as such the East Romans were unable to resist the invasion of the Lombards in 568, which led to the loss of large parts of the Italian peninsula. 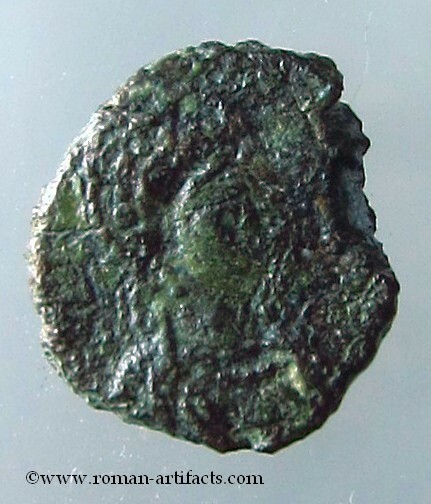 OBVS: Diademed, draped and cuirassed bust right. 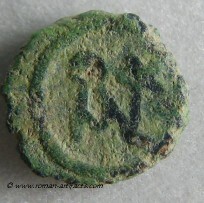 REV: Monogram number 2 of Justinian I within linear circle. 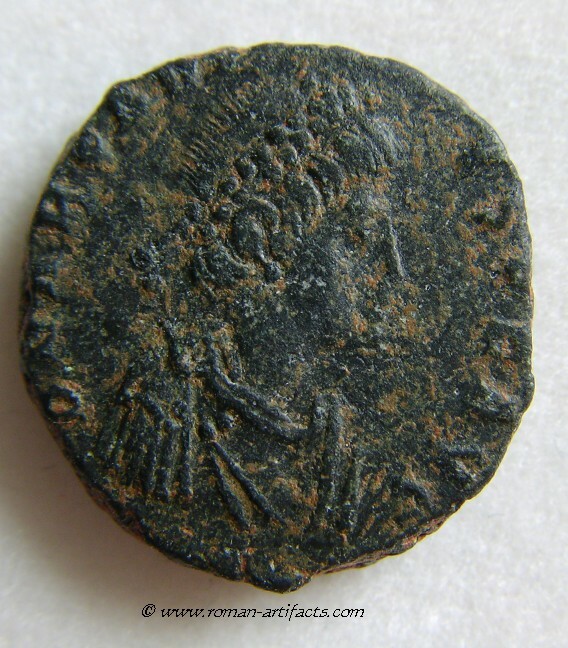 Justinian I began the re-conquest of large parts of Africa and Italy that had previously been lost to the Vandals and Ostrogoths. For a short period of time the Roman Empire was nearly whole again. REV: DN REX with line above DN and B underneath (not visible). Surrounded by wreath. 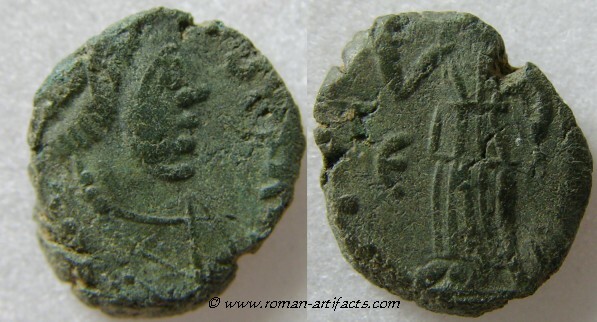 OBVS: [DN] IVSTIN IANV [S] Helmeted, cuirassed bust front holding globus cruciger and shield. REV: Lion standing right within wreath. References: Berk 289. MIBE 232. 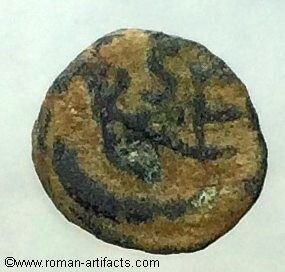 This type with a lion on the reverse may have been introduced by the famous Roman/Byzantine general Belisarius in connection with the ludi saeculares of the city (Rome) in 547; the 1300th anniversary of Rome's foundation. 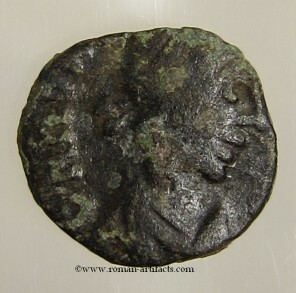 A very rare coin, with a short minting period and an important historical point. 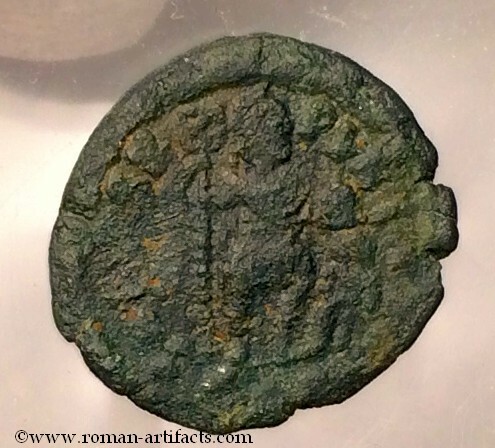 Its connection to one of the greatest late Roman generals also make it further interesting. 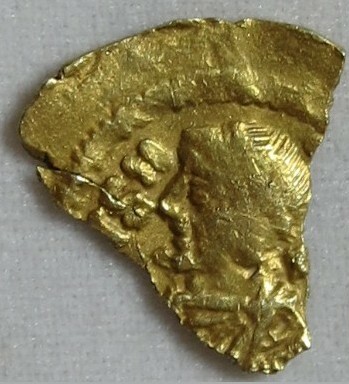 Gold Tremissis (Fragment). 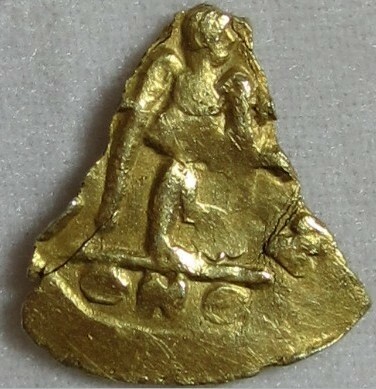 0.6 gr. REV: VICTORIA AVGVSTORVM Victory advancing right, head left, holding wreath and cross on globe; star in right field; mintmark [C]ONO [B]. References: DO 13-14; SB 353. 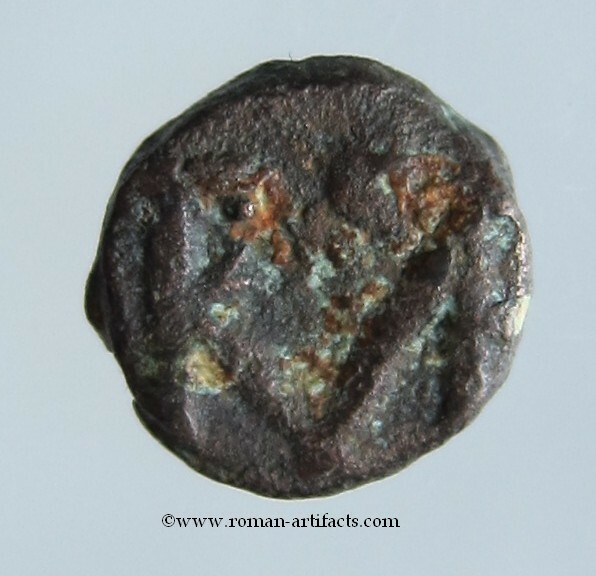 Due to the left facing bust, and the C and B missing, it is likely that the this coin is some type of barbaric imitation from the period. 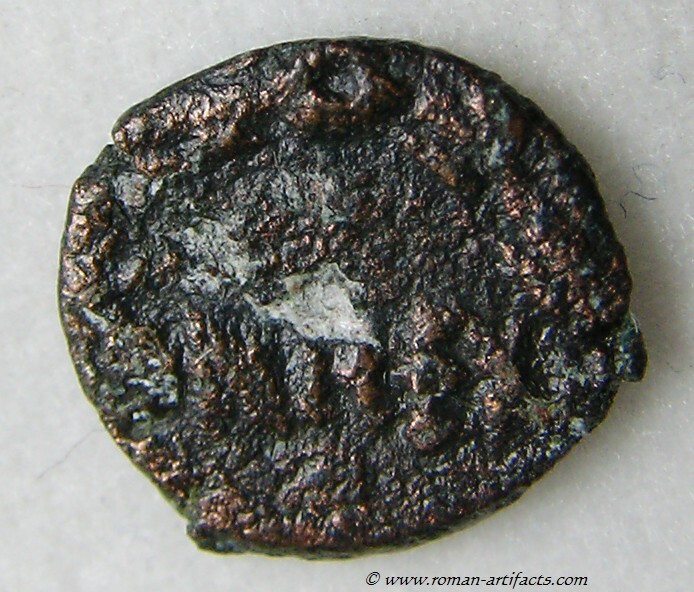 Large areas of Italy, Spain and other areas which had been captured previously by Justinian I were lost. It is likely that this coin was struck during this period of decline in one of these areas.